CicLAvia, L.A.&apos;s hometown tradition of turning our streets into bike-friendly zones, will return to its "Heart of L.A." route Sunday. Streets across downtown, Boyle Heights, Echo Park, and Chinatown will be closed to cars, allowing cyclists and pedestrians to explore these historic neighborhoods freely. The event starts at 9 a.m. and ends at 4 p.m. The route features four different hubs: one at Echo Park Lake, one at Mariachi Plaza, one near the L.A. State Historic Park in Chinatown, and one at 7th Street and Broadway. There are two main routes—north-south along Broadway and east-west from Echo Park to Boyle Heights—and they intersect at 2nd Street and Broadway. Street closures will begin at 7 a.m. and will end around 6 p.m.
Each hub will feature activities for the duration of the event. Echo Park will host a "CicLAvia Pit Stop," featuring DJs and a discussion on "the intersections of art and development in the Los Angeles nightlife and music scenes." Street Poets will bring their Poetry in Motion van to the Broadway hub, the Mariachi Plaza Farmers&apos; Market will sell produce all day, and the Chinatown hub will showcase bands at Mandarin Plaza. 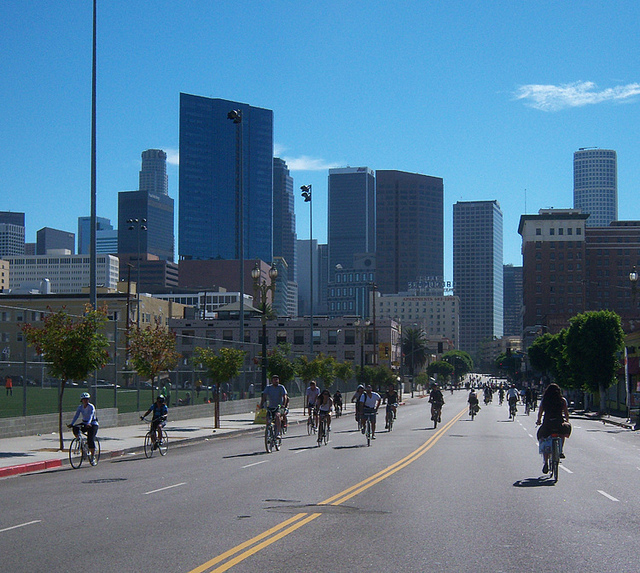 A full list of activities during Sunday&apos;s CicLAvia event can be found here. This is the fourth CicLAvia of 2017. The final route will be a return to Wilshire Boulevard on December 10. This edition of CicLAvia comes a few days after Metro introduced a pilot version of their bike share program to Echo Park. The popularity of the pilot program will help Metro determine whether to install a permanent hub in the area.